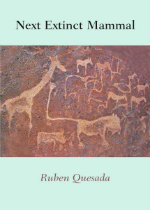 Reading Next Extinct Mammal (Greenhouse Review Press), the debut collection from Ruben Quesada, is like sifting through a box of small, rare gems. The poems, which range from tight sonnets to plainspoken prose poems to free verse, blend Western traditions and delicate prosody with refreshingly bold subject matter. The surprise of lines like these lies not just in the culturally specific references, done so well by poets like David Trinidad and Michael Montlack, but also in the clever enjambment—the surrealist “breakfast of rainbow” pouring into a mundane cereal bowl, the butter of light, the “swallowing” of cartoons instead of Lucky Charms. In this way, each image does double duty. Maria and Jesus are neighbors running hoses, but they are also running; they even contend with sinister Biblical serpents. Quesada is a master of this kind of intentional ambiguity, demanding balletic agility from the reader, keeping us on toe point the whole time. Quesada, a former Lambda poetry fellow whose work has appeared in The American Poetry Review and Palabra, revels in the grounded, specific names and places of his California childhood, and invites them to join Zeus and Aphrodite in the pantheon of poetic allusion. for the next extinct mammal in America. To wait till the last line to tell us what the book hints at—it’s as if Quesada were saying, “Were you paying attention this whole time?” That Quesada dares this winking transgression, this stubborn risk, is the only thing that’s not surprising about this very surprising debut collection.